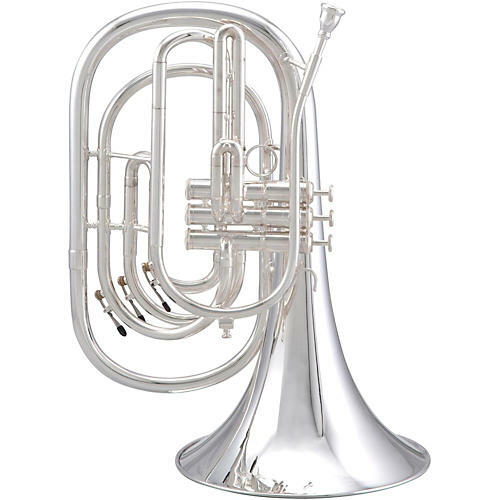 Large bore and bell give the marching French Horn excellent expression, blend and projection on the field. The unique mouthpipe of the model KBFH is bent at an angle to allow the player to maintain a classic downstream embouchure even during marching season. The KFFH has a lyrical sound and even response in all registers. Outstanding intonation is achieved with the tune-any-note feature. The mouthpipe gives your horn player a familiar frame of reference on the field. It is beautiful to look at, has a regal and complex tone, and projects like you won't believe. Kanstul is one of the greatest brass design innovators and Tama has a solid understanding of marching bands' needs. It is an ideal marriage of core competencies that has resulted in a new alternative solution for marching band challenges.